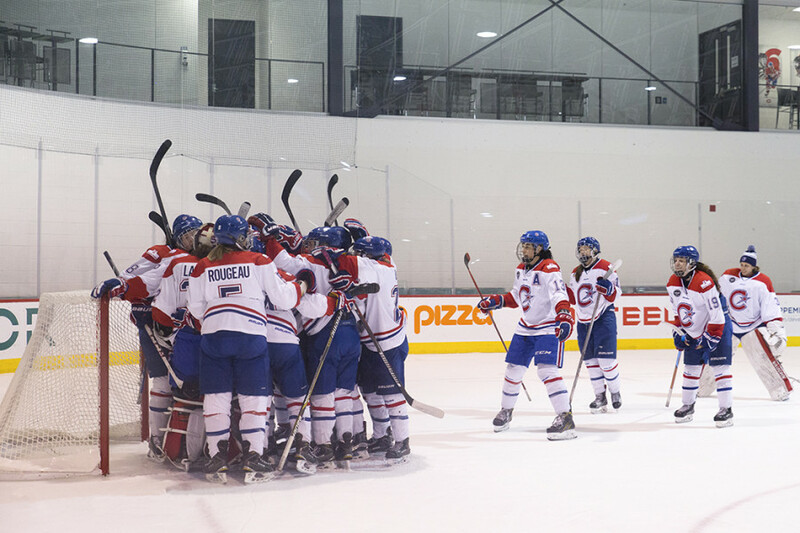 Montreal’s top line of Ann-Sophie Bettez, Caroline Ouellette and Marie-Philip Poulin combined for six points, leading Les Canadiennes to a 5-1 win over the Brampton Thunder in Game 2 of their semi-final series on Feb. 25 at the Bell Sports Complex in Brossard. With the win, Montreal punched the ticket to their third straight Clarkson Cup final. The game was delayed by 15 minutes, no thanks to a jersey mix-up. Despite playing at home, Montreal was the “away” team for the game. As result, they hit the ice for warm-ups wearing their white jerseys. However, much to their surprise, Brampton did the same. Neither team had their home jerseys. The Thunder left theirs in Brampton, forgetting their “home” status during the Saturday tilt. Similarly, Montreal’s home kit was left in Rosemont, at the Etienne-Desmarteau Arena, site of Friday night’s 7-1 drubbing of the Thunder in Game 1 of the series. The issue was resolved, with Brampton borrowing jerseys from the arena with Brossard written across the front. There were no names on the sweaters and the numbers did not match those normally worn by the Thunder players. As if the mix-up wasn’t enough, an issue with the lights in the arena delayed the start of the second period and then again midway through the third. After a lengthy pause, the teams eventually hit the ice under limited lighting. 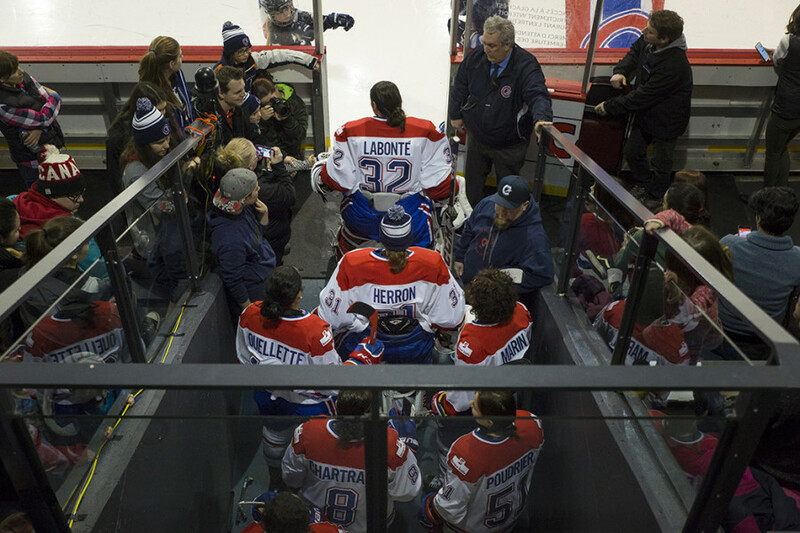 Still, multiple delays did little to deter Les Canadiennes. Poulin opened the scoring only 16 seconds into action. She broke free of two Thunder defenders before walking in unimpeded on Brampton goaltender Liz Knox. She went to her backhand to beat the Thunder netminder. With incredible effort, Bettez connected for a short-handed tally, banking the puck off the side boards and weaving around a Thunder player. Soon enough, she was in alone on Knox. Making no mistake, Bettez put Les Canadiennes up a 2-0 lead. Jess Jones got one back for Brampton with that same power-play opportunity, but it didn’t take long before Montreal responded with a man advantage of their own. Poulin took a feed from Ouellette just inside the blue line, sending a howitzer towards the opposition’s net that beat Konx—and popped a water bottle—and restored Montreal’s two goal cushion. Noemie Marin added an insurance tally for Montreal, making it 4-1 with a nifty deflection of a Lauriane Rougeau drive on goal. Kim Deschenes added an empty net tally. Now, Les Canadiennes await the winner of the Toronto Furies-Calgary Inferno playoff series, which is knotted at one game apiece. Game three between the two teams will be held in Calgary at 2:45 p.m. EST on Sunday. Unlike last year, there is no break between the semi-final series and the Clarkson Cup. Poulin isn’t concerned with this quick turnaround, though. The Clarkson Cup will be played at the Canadian Tire Centre in Kanata next Sunday at 4:00 p.m.